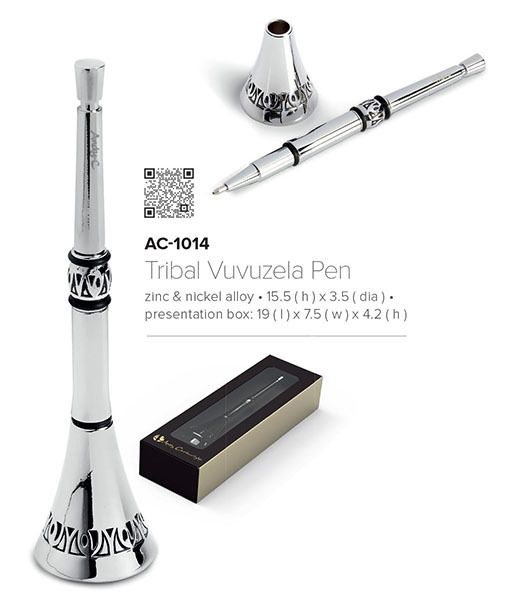 Andy Cartwright’s Tribal Vuvuzela Pen AC-1014, an african pen, AndyC designs vuvuzela pen, each vuvuzela pen is presented in a perfectly sized box foil stamped Andy Cartwright in gold giving it a stunning finish. This tribal vuvuzela pen was designed in 2010 when South Africa hosted the Soccer World Cup and remains a very popular African Conference Gift for your international conference delegates. These pens can be branded with your company corporate logo!